Iron Man is the last Avenger assembled when Avengers: Infinity War begins. Before there was even a cinematic universe, Robert Downey Jr.'s Tony Stark stood alone. As Nick Fury said, he became part of a bigger world unknowingly, but who would've guessed how true that statement would become. In the decade since Iron Man, Tony has gone on to lead the Avengers and create multiple super villains, all while trying to protect the universe. He's been tested time and time again, and especially recently. Captain America: Civil War started Tony's arc to being a better hero, a path that ultimately led to the Avengers team dismantling. The ending of that film, coupled with the trailer for Infinity War, teased what that means for the fight against Thanos (Josh Brolin). However, in the newly released prelude comic for Infinity War, Iron Man is very much on his own. Marvel's Avengers: Infinity War Prelude #1 was released today and includes several new details, and one specifically about where Tony is at prior to the opening credits. 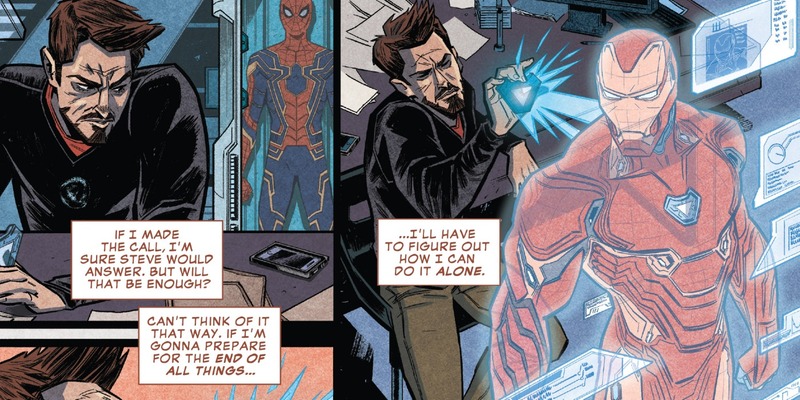 The final page of the issue depicts Tony slaving away in his lab (per usual), showing that he is very much all alone prior to Thanos coming to Earth. He recognizes the mistakes he has made and is contemplating calling Captain America (Chris Evans) at long last. The panel also includes a glimpse at Peter Parker (Tom Holland)'s new Spidey suit, as well as another glimpse at Iron Man's own new armor. This is just the first issue of the two-part prelude series, so fans will have to wait till the next issue is released to see what further events are detailed. As far as Tony's arc is concerned, him being alone isn't much of a surprise. Cap took most of the Avengers away and into hiding, leaving only Vision (Paul Bettany) and War Machine (Don Cheadle). The prelude comic also shows Vision off in disguise with Scarlet Witch (Elizabeth Olsen). While Tony may be alone now, the trailer for Infinity War confirms he won't be for long. The footage officially released so far shows him working with Hulk (Mark Ruffalo), Doctor Strange (Benedict Cumberbatch), and Wong (Benedict Wong) in New York, while also teasing Spider-Man will join them later on. The trailer also teased that Tony does indeed pick up the phone to call Cap, but we know their relationship isn't completely repaired just yet. Hopefully the impending doom Thanos brings further pushes Tony into believing the only way they can save the world is together.